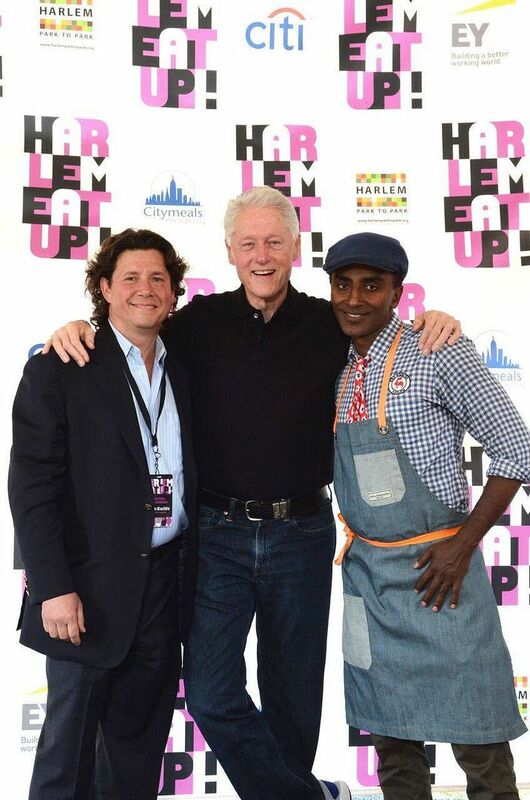 Herb Karlitz and Marcus Samuelsson, Producers of HarlemEatUp!, with Bill Clinton at launch. Marcus Samuelsson often tells the story about how when he was in Europe working in various kitchens, he would systematically write letters to chefs who worked in the best restaurants, asking for a chance to show his talents. He also wrote two letters to celebrities he had read about in magazines, thinking they might be able to help him as well; Martha Stewart and Oprah Winfrey among them. Much to his disappointment, he never received a response; and at the time, he was crushed. Fast forward to the last decade when both of these icons regularly reach out to him for his help. Marcus made his splash on the culinary scene in 1995 when the New York Times awarded him 3-stars at Aquavit -- the youngest chef ever to receive such acclaim. In 2010, he went on to open his own restaurant, Red Rooster, an instant hit and celebrity hot spot -- still a tough reservation, not to mention a bar scene that is literally four-deep on a Monday night at 11:00 PM. Marcus has four cookbooks to his name, which include his widely acclaimed autobiography, “Yes, Chef”, and a brand new book, “MESSY,” aimed at kids. If that doesn’t make for a full plate, his restaurant empire continued to expand when he opened a second, more casual spot in Harlem, Streetbird, as well as a restaurant in Bermuda at the newly fully renovated Hamilton Princess. Not to rest on his laurels, Marcus launched the hugely successful Harlem EatUp!, Festival, announced last May with the help of former President Bill Clinton and Mayor Bill de Blasio. Marcus and I are the co-producers, and I can attest that he was as “hands-on” as anyone during the 15-month production process. HK: Did you ever say anything to Martha Stewart or Oprah Winfrey the first time you met them? MS: No, I never confronted them. I just learn from them. I see how they attract the best of the best; they are their own perfectionists. I just relished the moment I was in their presence that first time; I didn’t focus on the negative. HK: Back in the day, who was your biggest chef influence? MS: Gray Kunz. He connected Southeast Asia with New York City and the West. Then Jean Georges took it to the next step with Kaffir lime leaves and lemon grass. I never knew about spices like that. I’ve also been lucky to meet so many icons in our business, who have been influences -- Julia Child, Charlie Trotter, George Blanc, others. HK: Growing up, you wanted to be a soccer player in the worst way, but you were told you weren’t big enough. In “Yes, Chef,” you explain how that experience really hurt, and you felt more like a ‘failed soccer player, than an accomplished chef.’” Explain. MS: Soccer was a huge part of my life growing up. I still love to get out there and kick a ball around. Soccer taught me about teamwork, which of course is critical in the kitchen. You also have to enjoy what you’re doing, have flair; you have to work at it. HK: What would you have done if you never made it as a chef? MS: I would have been a baker, or done something artistic, like a painter -- just to get that outlet for a creative expression. Painting and writing for me is very solitary and a nice balance to the kitchen where there is a team. HK: What are your favorite restaurants? MS: Spring day at Barbuto: It’s about the unique experience. I never look at a menu. Jonathan [Waxman] has that sense that I am going to take care of you, and it’s going to be delicious. It always is. MS: Tokyo -- it’s still so foreign; and London; it’s so cosmopolitan. MS: Spices with too floral a nose, like too much saffron. MS: Besides fashion? I am in love with style! I’m completely in love with music. I love to sneak out or right downstairs at Ginny’s and watch a sound check or rehearsal while drinking a good glass of red wine. Musicians are so cool! I am happy to be able to provide a slice of a musical experience in my own way with Ginny’s. MS: I still get butterflies, but when I was younger, my stomach had major problems. I was too young with too much pressure. I had to learn languages, I was terrified to make a mistake in front of the older guys. Plus, I was conscious that I looked different from everyone else. Click here to read the rest of the Karlitz-Samuelsson Q&A on HauteLiving.com. Click here to return to short order listings.